The story of outlaws Clyde Barrow and Bonnie Parker who gained fame and notoriety for a crime spree during the depression, Bonnie And Clyde is a stylish and groundbreaking film. It established Warren Beatty's reputation, catapulted Faye Dunaway into stardom, elevated Arthur Penn to the list of top directors, and opened the door for the celebration of criminals and for more gory on-screen violence. It's the early 1930s in depression-hit southern US. The suave Clyde Barrow (Warren Beatty) has recently been released from a stint in prison for armed robbery, and he's back seeking a life of crime. Bonnie Parker (Faye Dunaway), an attractive but bored waitress, catches Clyde about to steal her mother's car. Both in their early 20's, he seduces her with the promise of a better life; she sees in him the opportunity to escape the drudgery of her boring destiny. Soon they are robbing stores and banks in a trail of crime with ever increasing violence across several states. They are joined by car mechanic C.W. Moss (Michael J. Pollard), Clyde's brother Buck (Gene Hackman), and his wife Blanche (Estelle Parsons). After several shoot-outs with police officers and many narrow escapes, the gang gains unprecedented notoriety thanks to breathless press coverage, and the duo take on the aura of heroic fugitives sticking it to the system. As the stakes get higher, so do the risks, as the authorities ratchet up the intensity of the chase to bring Bonnie and Clyde to some form of justice. 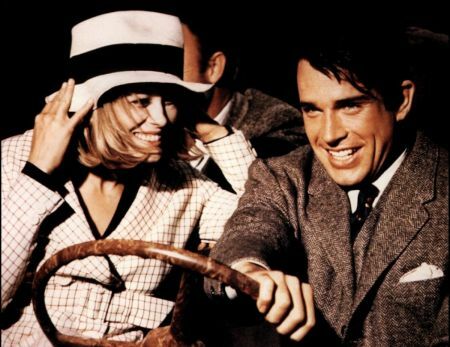 Bonnie And Clyde needs to be accepted on its own anti-establishment terms, which matched the rise of the counterculture in the second half of the 1960s. The film invites controversy by shining a sympathetic light on its subjects. They are young and attractive; Clyde is portrayed as smart and instinctive; Bonnie is ambitious, sensual and headstrong, as well as a budding poet who cares for her mother. Both are playful and get a rush from taking risks. In contrast, their victims are mostly faceless and nameless police officers, guards, storekeepers and bank officials, who get shot and killed trying to do their jobs. As Bonnie and Clyde hurtle towards a messy end, they are portrayed as having a lot of fun getting there. It is irrelevant whether the real Bonnie and Clyde were Robin Hood-type heroes of the poor folk; the film unapologetically chooses to make them likable, and the unease that this generates is part of the movie's lasting appeal. In addition to taking a less than stern view of its criminal subjects, the movie was also highly influential in moving the goalposts of graphic violence portrayal on the mainstream cinema screen. There is blood aplenty as the Barrow gang carve a trail of crime through the countryside, with the cameras not turning away when victims are shot in the head at close range. It was a short step from here to the rivers of blood in The Wild Bunch (1969) and the blood-drenched sheets of The Godfather (1972). 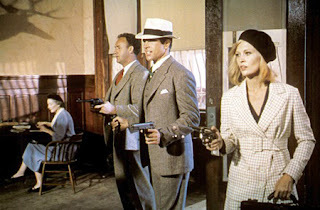 Beatty and Dunaway were only a few years older than the real Bonnie and Clyde at the time of filming, and they are both engaging in their portrayal of the young criminals. Dunaway colours Bonnie Parker as a complex, easily irritable woman who needs adventure, loves to have fun, and craves attention. Beatty establishes Clyde Barrow as an intelligent man, seduced by a life of crime, enjoying the thrill of the chase but quick to turn to violence. Gene Hackman, Michael J. Pollard and Estelle Parsons in an Academy Award winning role bring a lot of vivid, memorable energy to their supporting roles. From the cars to the costumes and from the sets to the landscape, Bonnie And Clyde looks gorgeous. Arthur Penn captures the depression of the early 1930s, and frames the action in breathtaking vistas of the middle-America rural countryside. The cinematography of Burnett Guffey and the music score of Charles Strouse are a perfect complement to Penn's vision. Although Bonnie Parker and Clyde Barrow had fun escaping the responsibilities of real life, Bonnie And Clyde does end by emphasizing that crime carries a cost; but the film certainly presents rich entertainment on the way to its conclusion.